With a managerial CV that boasts of 3 Bundesliga titles, 3 German Supercups, 2 UEFA Intertoto Cups, 1 Spanish Supercup and 1 Champions League, it’s hard to imagine that someone would be without a job, especially considering that he has taken his team to the Champions League final after a League-winning season. Yet, that is where Josef Heynckes finds himself. Come this Saturday, when his Bayern Munich side take on domestic rivals Borussia Dortmund in the UEFA Champions League final, he will be managing this Bayern team for the last time. With Pep Guardiola set to take over the reins from Heynckes, following his year away from football, Heynckes will have departed quite possibly after delivering what is the ultimate prize in European club football, the Champions League crown. The most telling contribution in this, his third, stint as the manager of the Bavarian giants has been successfully integrating key Bayern youth players Toni Kroos and David Alaba into the first team. 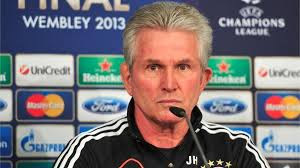 Heynckes, the man who’s managed in over 600 Bundesliga games, set the team up to play their way to the Champions League final of 2012 at the Allianz Arena, their home ground, only to have their hopes dashed by a resilient Chelsea side. This year, he’s back again, guiding Bayern back to the final, accounting for Arsenal, Juventus and the mighty Barcelona along the way. The way they outplayed Barcelona was a testament to the tactical acumen of Osram, as Heynckes is universally known among German football aficionados, and would definitely be the high point of a great season for the German tactician. What seems most bewildering is the manner in which Bayern decided to dispense with his services at the end of this season despite such good results, a win rate of 75.7% in the two seasons he’s been in charge- it probably comes down to the appeal of hiring Guardiola to guide the team to even greater heights. So, it hardly is a surprise that Heynckes isn’t short of suitors who want him to take over the managerial duties, given his excellent record throughout his career. At the forefront of the queue is Real Madrid, who themselves have decided to end their love affair with “The Special One” Jose Mourinho which has turned bitter. The man, who has brought Bayern on the verge of a treble, has also expressed that he is considering retiring. We’ll have to wait to find out where he ends up next season, but if he decides to retire, it will be a huge loss for the beautiful game.